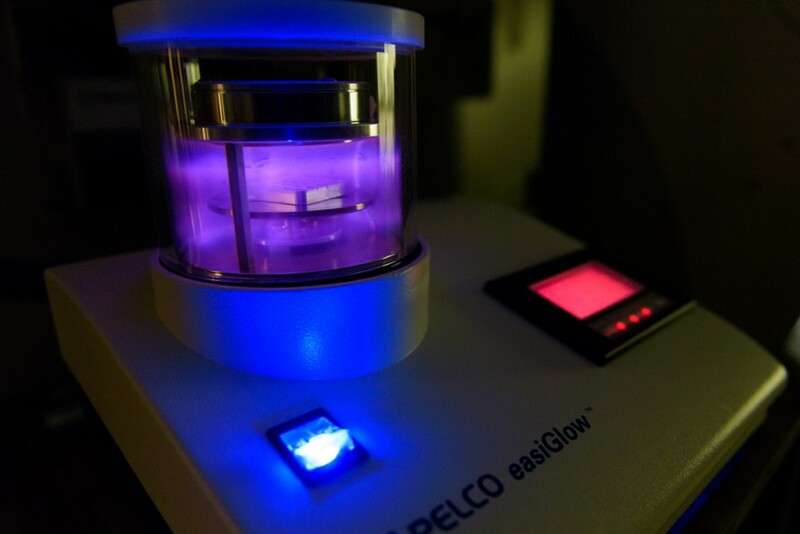 Since the support films on TEM grids are naturally hydrophobic, the glow discharge system is used to deposit a charge onto TEM grids. The charge renders the grids hydrophilic and allowing an aqueous solution of particles to spread uniformly and adhere to the grid surface. The unit greatly facilitates projects requiring negative staining or cryo-TEM. 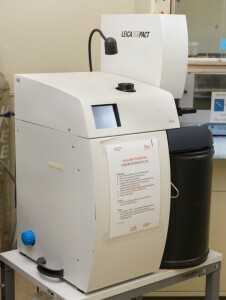 The Leica EM Ace 600 is a high vacuum film deposition system for coating samples for scanning electron microscopy. The system is configured for carbon coating via carbon thread and sputtering with a platinum target. The Leica EM PACT freezes a specimen with a jet of liquid nitrogen as it is pressurized to 2100 bar. Under such conditions, the freezing point of water is depressed, and the rate of ice crystal growth is decreased, allowing up to 600 microns of the specimen to become vitrified. High pressure freezing followed by freeze substitution overcomes many of the disadvantages of conventional chemical fixation and leads to better structural preservation. 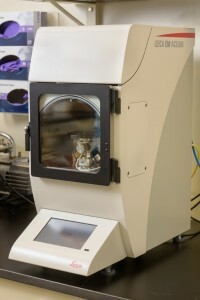 The Leica EM AFS performs automated freeze substitution and progressive lowering of temperature (PLT) techniques and allows low temperature embedding and polymerization of resins. 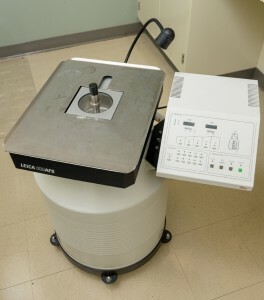 The Leica CPC is a multipurpose cryo-workstation that has attachments for metal mirror freezing and plunge freezing of TEM grids and specimen pins. The system is equipped with high purity, research grade ethane for preparation of aqueous solutions of particles for cryo-TEM. 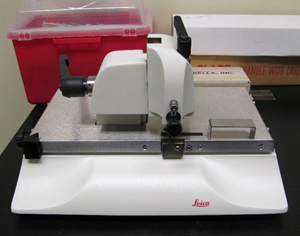 The Leica EM KMR2 allows users to make glass knives for ultramicrotomy. The Leica EM IGL is a device that automates immunogold labeling with little user intervention. Up to 99 different programs can be loaded into the system. Drops of reagents (block, buffer, antibodies, etc.) are pipette onto teflon coated slides, and nickel grids (up to 24) are loaded onto a magnetic grid holder. Upon starting a program, the reagents on the slides are brought into contact with the grids and incubated for the duration defined by the program. The Pelco Biowave allows rapid sample processing through the use of microwaves. The system can be configured for tissue processing, immunolabeling, and decalcification. 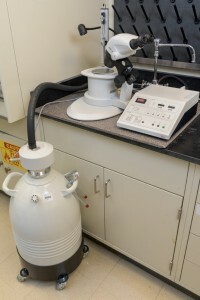 The Tousimis Autosamdri-815B is a fully automated, large format critical point dryer with a 4.5 inch inner diameter and 1.25 inch chamber depth, which allows for processing large batches of samples for scanning electron microscopy.